The Chairman of the House Agriculture Committee was back in his home district, tending to the folks on a community by community basis. 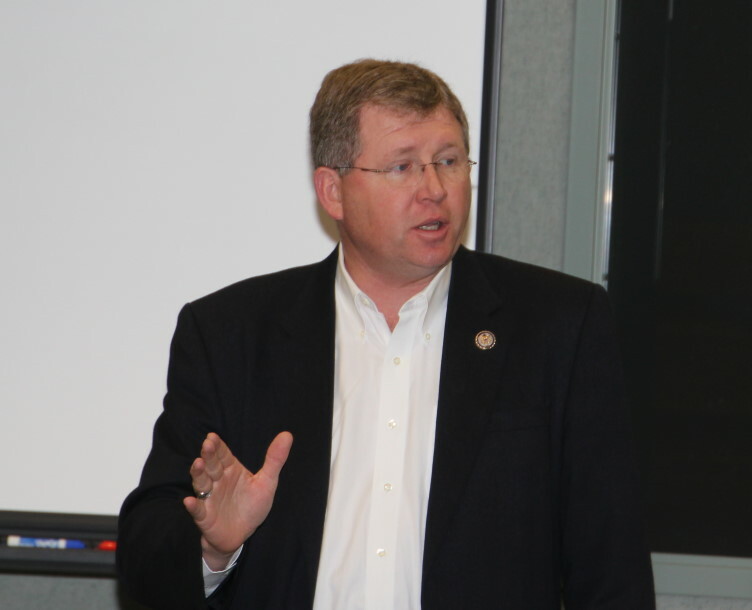 Congressman Frank Lucas of Oklahoma's Third Congressional District held a total of 14 Field Hearings during four days of the Easter Congressional break. His last stop was El Reno, the county seat of Canadian County. During the hour session, Congressman Lucas took the first fifteen minutes and talked about the federal debt and the upcoming debt to raise the debt ceiling, about Libya and about the process of his Committee preparing to write the next farm bill. About 50 citizens showed up, and they offered commentary and asked a few questions on subjects like Healthcare, Social Security and Medicate. There were also some members of the Cheyenne Arapaho Indian Tribe that addressed the Congressman, asking for help regarding the treatment of the tribe by state entities. After his hour before the folks, we retreated for a conversation about a variety of agricultural issues, including what ramifications the upcoming debt ceiling vote may have on farm program spending- both this year as well as in the future. We also talked about whether Crop Insurance should be folded into the next farm bill or should continue to be a separate piece of legislation, how the education of the new members of Congress on his Committee is coming, the timing of the next farm bill- Congressman Lucas remains dead set on waiting until he knows the budget number of next spring before trying to craft a farm safety net that can work for farmers across the country and the oversight efforts to this point under his Chairmanship of both EPA and USDA. You can listen to our full conversation with Congressman Lucas by clicking on the LISTEN BAR below.